In a relatively short period, Cyber Monday has come to rival more established holiday shopping contenders — including its closest neighbor, Black Friday. This year, according to the IBM Digital Analytics Benchmark, total sales for Cyber Monday were up 8.7 percent over 2013, helping to save an otherwise lackluster Thanksgiving period for many retailers. 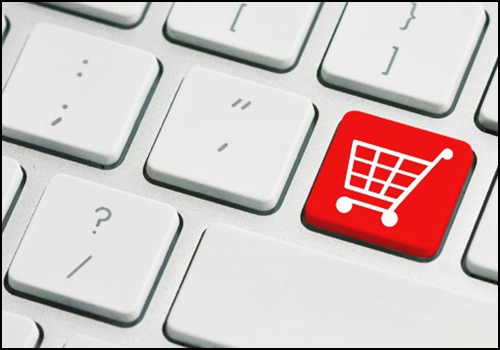 Yet despite being the busiest online shopping day, Cyber Monday offers a few challenges for campus sales, not the least being that most colleges and universities are deserted for the holidays. The connection between school and holiday shopping can seem remote. However, for the tech savvy student, the fact that all the Cyber Monday action happens online has created a timely sales opportunity for customers of college bookstores, and especially so this past holiday season. 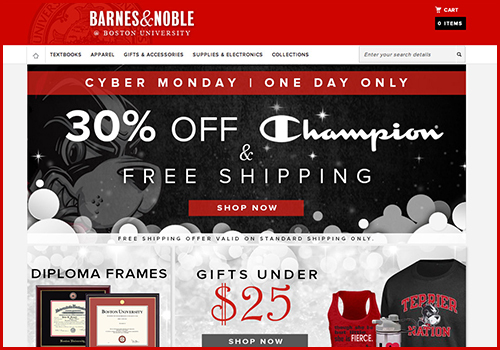 “Cyber Monday was really strong for us this year,” reports Tamara Vostok, Manager, Consumer & New Media Marketing for Barnes & Noble College, ratifying a record-making sales period for the company that saw Cyber Monday sales nearly double over last year. To ensure the success of their lead holiday promotion, the company went to their customers for recommendations on the kinds of online promotions they’d find the most attractive. “We based our whole offering around what the students wanted by using our Barnes & Noble College Student POV [Point of View] research panel,” Vostok says, “and in our survey we asked them what they would most look for in an online promotion regarding discounts,” she adds. The resounding answer resulted in the campus retailer offering 30 percent off the popular range of Champion apparel and products in an exclusively tailored online-only offer. “We wanted to demonstrate to our students that we were listening, and wanted to ensure we were front and center of their holiday shopping — even when they weren’t on campus,” Vostok says. In that same spirit of the holidays, Barnes & Noble College bookstores also offered online customers free shipping, which Vostok maintains is an important feature for a customer increasingly concerned with distribution. “It’s the holidays, and our customers don’t want to have to be concerned with additional shipping charges,” she says. It’s a customer service philosophy that proved popular this past holiday season, and with the offers prominently advertised on their bookstore’s homepages, the promotion was hard to miss for Cyber Monday shoppers. “As an online promotion, we were able to appeal not only to our students, but faculty, alumni — anyone shopping from the comfort of their own home,” Vostok maintains. Even when the campus is quiet, the online promotions from the campus bookstore offer customer value and convenience, which is probably never more important than in the rush of shopping for the holidays.